Our Efficiency Suites have a private bedroom with queen size bed, and a separate living room with queen sleeper sofa or 2 Loveseat Twin Sleepers. There is also a full bath, and a kitchenette fully equipped with cookware and dishes, 2 burner stove top, mini refrigerator, coffee maker, toaster and eating area. Our suites accommodate up to five guests. Rates for the suite vary depending on season from $85 to $150 per night. Check the schedule link below for details. 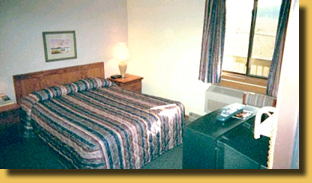 All Motel Rooms have a Queen Size Bed and a full bath. 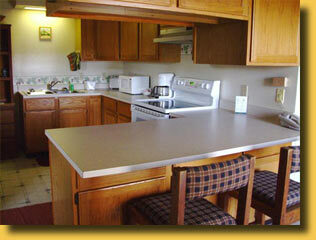 The rooms also have a small table with chairs, a coffee maker, and a mini refrigerator. Rooms accommodate two guests. Rates for the motel rooms vary from $70 to $110 per night, depending on the season, holidays, and on what special events are taking place on the Island such as the oyster festival. The apartment has a Private Bedroom with 1 Queen Bed, a separate Living Room with Queen Sofa Sleeper, a Dining area with Table and Chairs and an "Eat-at" Counter. 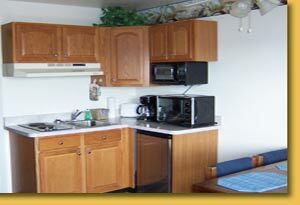 The kitchen boasts a full size stove, full size refrigerator and a washer and dryer. The apartment also has a full bath. This unit accommodates five guests. Rates for the apartment vary from $110 to $170 per night depending on season and Island events. * Cancellation fee imposed for less than 72 hours notice. * No pets of any kind. * We do not guarantee specific rooms but will try to accommodate special requests. * No refunds due to weather or early departure. * Full payment upon check in. * Refusal to pay in full at check in may be considered a cancellation. * No bicycles in rooms. * Check In 3:00 pm and Check Out 11:00 am.